As soon as I made this batch of Girl Scout Cookie Stuffed Donuts, I immediately asked myself what have I done?? These donuts are ridiculous, you all. We only buy a few boxes of Girl Scout cookies each year. I pretty much hoard them like a squirrel packing away acorns for the winter. 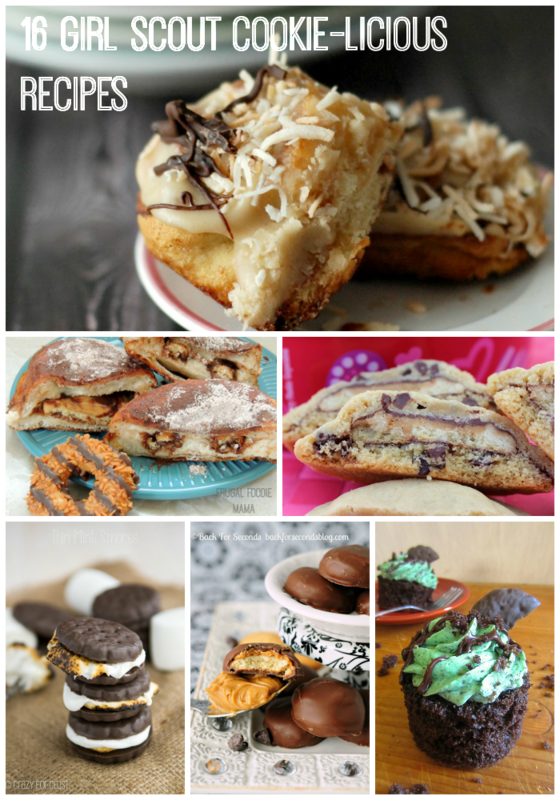 And I see all these amazing recipes all over food blogs using Girl Scout cookies. But a lot of the ones I have found myself wandering over to check out and pin use like an entire box of Girl Scout cookies in them! Pour the cocoa powder & powdered sugar into a shallow bowl/dish and whisk until well combined. Set aside. Heat the oil in a deep skillet until the temperature of the oil reaches 375 degrees. This took about 5 minutes or so for me. While the oil is heating, lay out a sheet of waxed paper. Separate the 8 biscuits and lay them out on the waxed paper. Take one of the biscuits and find a layer near the middle and peel back. 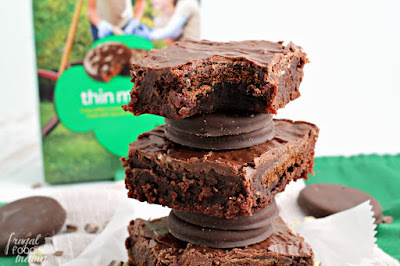 Add a Girl Scout cookie to the center & then flip the top layer back over top. Gently press the dough along the edges to seal in the cookie. Set aside. Repeat this for the remaining 7 Girl Scout cookies. Once you oil is heated, place the biscuits in the oil 4 at a time. Fry 2-3 minutes per side or until golden brown. Remove & place on a paper towel lined plate. Allow the donuts to cool for 1-2 minutes & then roll the still warm donuts into the cocoa/powdered sugar mixture. Repeat this for the remaining 4 donuts. Serve immediately. These donuts are best eaten the same day and while still warm. It really is imperative that you use the flaky layers biscuits. 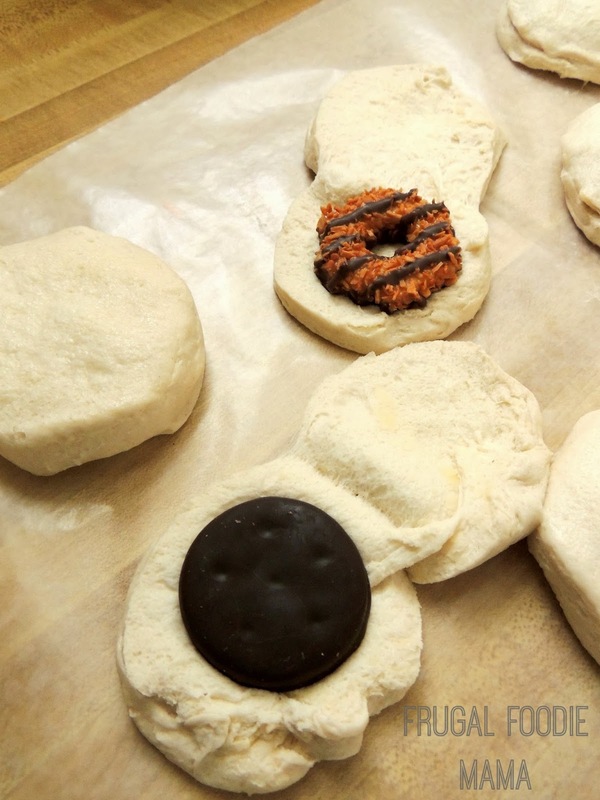 You have to be able to easily peel back the layers of biscuit dough to stuff them with the Girl Scout cookies. 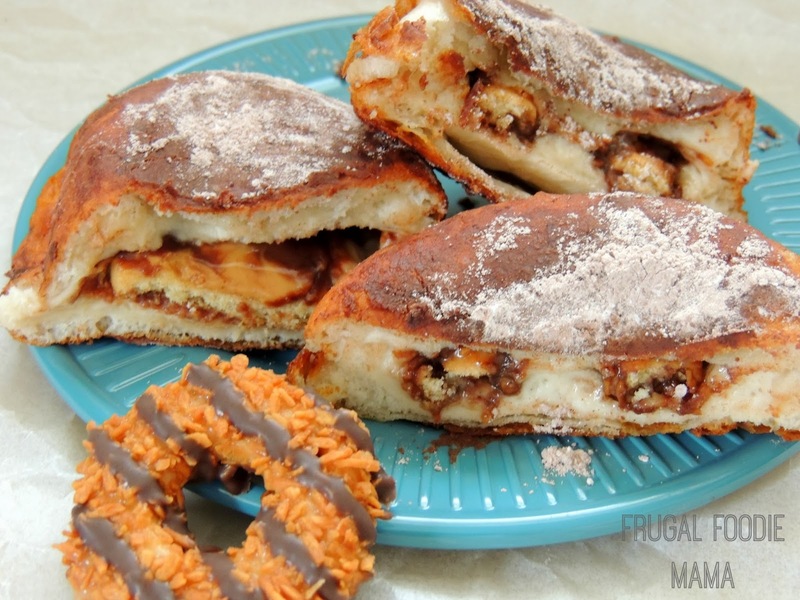 I am also partial to using the Samoas and Tagalongs in these because once they are heated through during the frying, they make for gooey, oozing centers. ;) My husband, on the other hand, actually liked the Thin Mint stuffed donuts best, but I felt they lacked the ooey, gooey-ness factor. 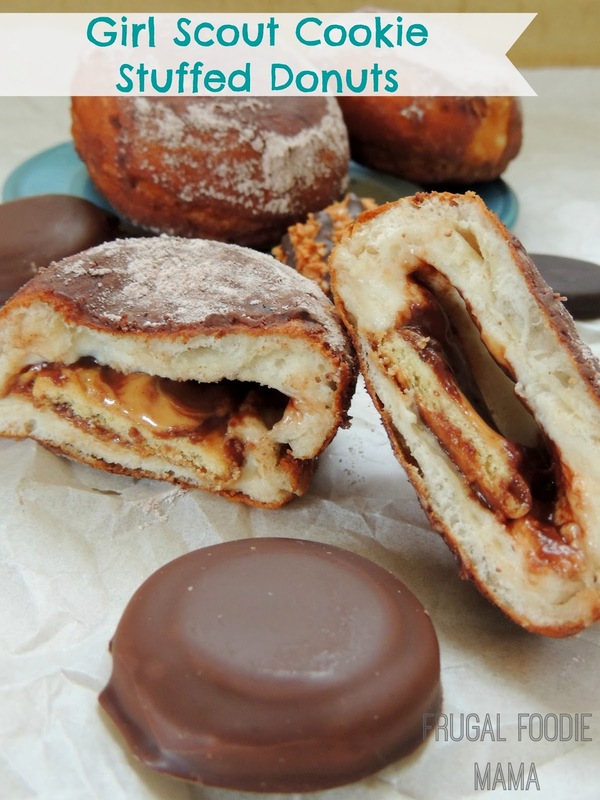 These Girl Scout Cookie Stuffed Donuts are so simple and quick that you do not even need to wait until the weekend to make these. You can have these on the table in about 20 minutes even on a weekday morning. 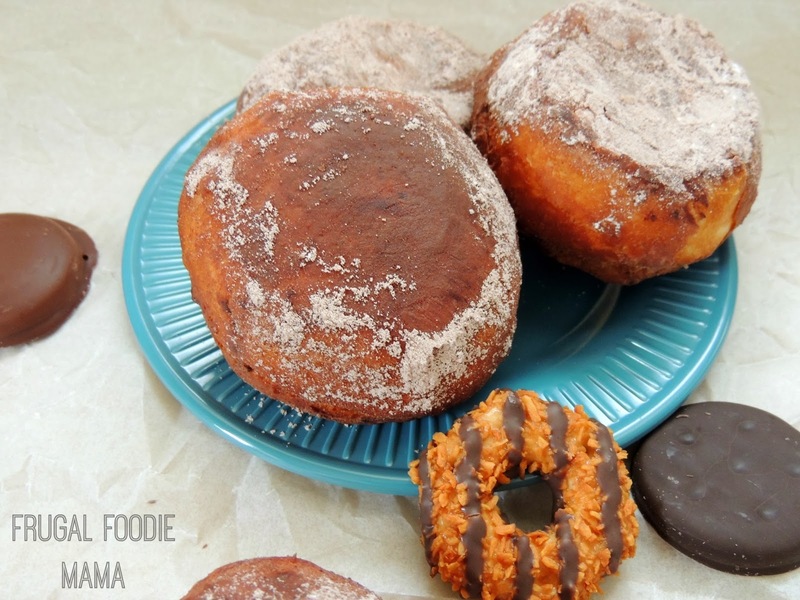 Which Girl Scout cookies will you stuff your batch of donuts with?